Shakespeare plays onstage in May across the U.S. The cast of A Midsummer Night’s Dream, Seattle Shakespeare Company, 2017. Photo by Chris Bennion. Vanessa Miller as Titania and MJ Sieber as Bottom. A Midsummer Night’s Dream, Seattle Shakespeare Company, 2017. Photo by Chris Bennion. Every month, we share a snapshot of Shakespeare in performance around America. This month, we check in with our theater partners at Seattle Shakespeare Company, Commonwealth Shakespeare Company, Folger Theatre, Shakespeare Theatre of New Jersey, and Atlanta Shakespeare Company. There’s no business like show business! Seattle Shakespeare Company has created a “a musical valentine to show business told with fairy magic” with its production of A Midsummer Night’s Dream (May 3-21), inspired by movie musicals of the early 1930s to mid-40s. The cast of Timon of Athens at Folger Theatre, directed by Robert Richmond, 2017. Photo by Teresa Wood. Eric Hissom (Apemantus) and Ian Merrill Peakes (Timon) in Timon of Athens at Folger Theatre, directed by Robert Richmond, 2017. Photo by Teresa Wood. If A Midsummer Night’s Dream is one of the most popularly performed Shakespeare plays today in the U.S., Timon of Athens is surely one of the least. In a blend of tragedy and satire, the title character experiences a stunning fall from wealth and popularity to bankruptcy and isolation. Antoinette Robinson (Flavius) and Michael Dix Thomas (Lucius) in Timon of Athens, Folger Theatre, directed by Robert Richmond, 2017. Photo by Teresa Wood. 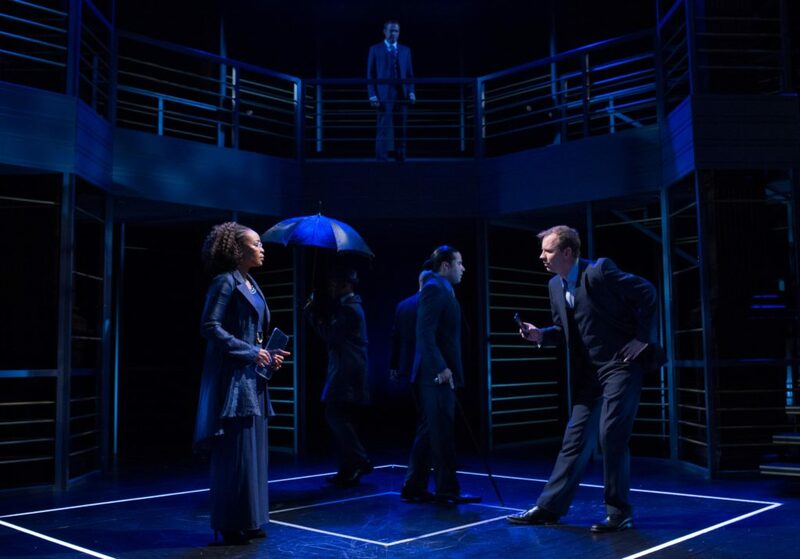 As the first show in its 55th season, Shakespeare Theatre of New Jersey presents The Merchant of Venice (May 17-Jun 4), a play it hasn’t produced in 17 years. “Never has there been a better time than now to present this 400 year-old-play,” says Artistic Director Bonnie J. Monte. “It mirrors our current society so closely in so many ways that one could imagine it was penned just yesterday.” Costume designs draw on styles of the early 1900s. Atlanta Shakespeare Company is finishing up one Shakespeare comedy and starting another this month. The Comedy of Errors runs through May 21, and next up is The Two Gentlemen of Verona (May 26-Jun 11). This month at the Oregon Shakespeare Festival, Shakespeare fans will find plenty to love in Julius Caesar, Henry IV Part One, and Shakespeare in Love, which all run through October. In Massachusetts, Commonwealth Shakespeare Company is staging Julius Caesar (May 8-16) for its Stage2 programming, aimed at students grades 6-12. The shows are performed by the CSC2 Company, a group of young professional actors in residency with Commonwealth Shakespeare Company for the year. Most performances are student matinees, but there is a public performance May 13.